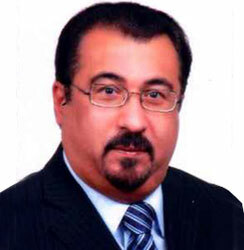 Abdallah A. Ghaffar born in 1951 Manama Bahrain. Ghaffar completed his elementary and secondary education in Bahrain and continued his studies in Kingdom of Saudi Arabia in university of Riyadh and higher education in United Kingdom where he did his master degree in town and regional planning. Through the course of his career he has worked as an architect, planner and manager of planning departments all of which enriched his artistic and practical perception and experience. University of Sheffield – U.K.
Senior Architect (Physical Planning Directorate – Ministry of Housing). Head of Urban & Renewal Dep. (Physical Planning Directorate – Ministry of Housing). Head of Detail planning Detail planning Dep. (Physical Planning Directorate – Ministry of Housing). Manager of National planning Dep. (Physical Planning Directorate – Ministry of Housing). Al – Qusaibi Building (Exhibition Road).